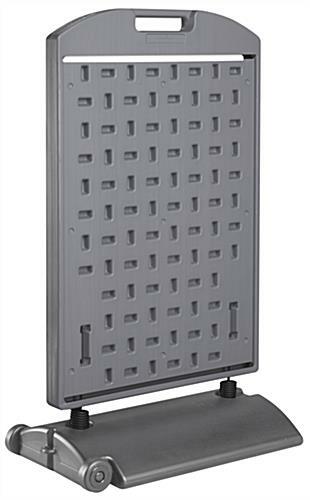 Handle and wheels make the board easy to move from one location to another. This wind sign is an incredible value! 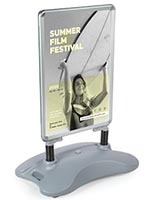 The pavement board is a simple design for an economocal way to showcase items. 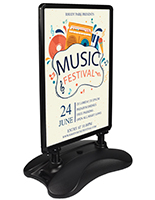 This wholesale outdoor sign, wind sign is sold without lenses, graphic blanks, Coroplast®, or Sintra® signs. 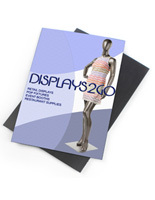 This option is ideal for print shops or individuals that already have custom graphics. 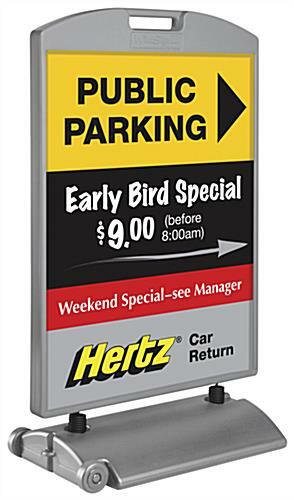 Sold at such an affordable price, the wind sign can then be resold to your sign shop's customers! The value of the board is unparalleled. This wind sign is incredibly easy to use. 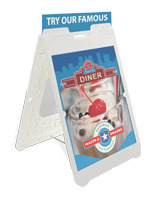 Once a custom sign is inserted, simply place the securing clips on the frame to ensure signs stay in position. 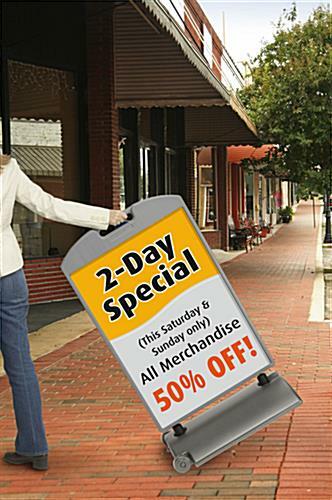 The wind sign, also known as a sidewalk sign, is ideal for outdoor use. 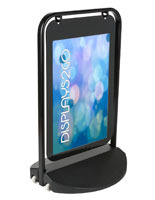 The durable construction ensures long lasting use. 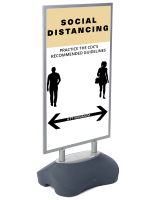 An almost completely polyethylene plastic construction means this wind sign will not rust or splinter. 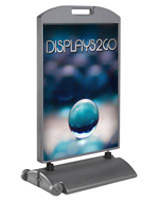 The base of this outdoor sign may also be filled with water or sand for extra stability during inclement weather. 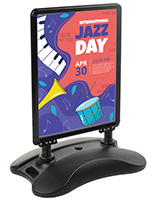 This sidewalk sign, wind sign has spring connectors attached to the base and sign frame, allowing the unit to flex with the wind. 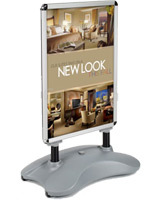 Tie down holes allow this outdoor sign to be chained or wired to deter theft as well. The wind sign can be used indoor as well. 26.0" x 40.0" x 17.5"
26.0" x 4.5" x 18.0"